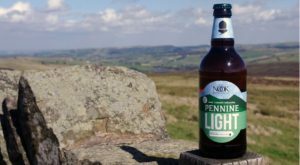 Pennine Light is part of an on-going project to support The Pennine Way National trail which runs right passed our Holmfirth brewery in the heart of the Pennines. When we were asked to brew an official beer of the Pennine Way we turned to a style of beer that was, at one time synonymous with the mill and farming towns of the Southern Pennines. Pennine Light Mild. With Pennine Light 3.5% abv we have created a pale and refreshing “Modern Mild” for the 21st century. A low gravity beer with a balance of sweetness and bitter hop character which make it very refreshing and exceptionally quaffable.